The Thracian Tomb of Sveshtari is a 3rd century BC tomb that reflects the fundamental structural principles of Thracian cult buildings. The tomb's architectural decor is considered to be unique, with polychrome half-human, half-plant caryatids and painted murals. It was rediscovered in 1982. 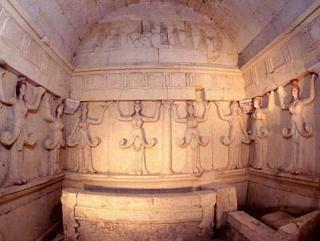 It differs from the Thracian Tomb of Kazanlak as it is a hypogeum, not a construction with a cupola. With its origins in the culture of the Getae, it fits a Hellenistic model that was common in Macedonia, Asia Minor and Egypt. The 3rd century BC Thracian Tomb of Sveshtari is a richly decorated tomb with a unique architectural decor. It was the second WHS that we visited during the 2018 WH Travellers Meeting. In advance I had tried to make a reservation for our group of 15 - I had read that sometimes you have to wait a while at the site before a guide is available. The e-mail contact in English with the visitor center proved to be rather inconclusive (similar to my experiences with other agencies in Bulgaria). When we arrived at 3 o'clock though we were expected and welcomed by an English speaking guide. The tomb is located underground, under a 11 meter high burial mound. One can only enter it on a guided tour. The 'long' tour (along the inscribed site and 2 other tombs) costs 15 Lev (7.50 EUR). We had to wait until another group left the tomb – there’s not enough space for many visitors at the same time. Many burial mounds have been discovered in this area, but most are empty. Near the adequately equipped visitor center there are 3: the great burial mound of the king and his wife, plus two smaller burial mounds in which groups of aristocrats were buried. A footpath connects them. The large tomb is protected as if it were a Swiss bank vault. After entering a pin code, the guide opened the two sturdy automatic sliding doors that have been placed in the entrance quite recently. This gave access to the burial mound, but not yet to the tomb. First we entered a room containing a small photo exhibition. There we also needed to put plastic protective covers over our shoes. The original tomb made out of stone blocks has been cleared of sand and lies now in an open space within the shell of the mound. The tomb, which is over 7 meters long and 4 meters high, has a porch, two 'rooms' and the actual grave. You can enter until the doorway of the grave itself. There you see two stone benches, on which the corpses of the king and his wife were found. Around them, sculptures of 10 female figures ‘carry’ the roof of the tomb. The famous original colour scheme, “in ocher, brown, blue, red and lilac”, is hard to distinguish; I found the interior and the sculptures dazzling white thanks to the limestone that was used. Unfortunately you only get a few minutes inside before a kind of alarm goes off. You're also not allowed to take pictures. The guide also lead us to the other two tombs on the site. Several skeletons have been found here, probably members of noble families. Interestingly, these tombs were screened off by a heavy stone sliding door, so that the tomb remained open and deceased people could be added in several stages. In the porch of one of these tombs also the remains of a dog were found. All these graves are less well preserved than the great king's grave and they are also not decorated. The tour in total lasted for 45 minutes, but the highlight took about 30 seconds. 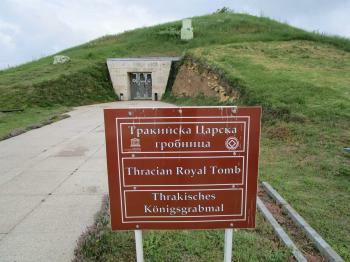 I visited the Thracian Tomb of kazanlak in January and then of Sveshtari in May. Staying overnight in Isperih, I took a bus from the main bus station of Isperih to the village of Sveshtari and from there walked about 2 km to the site. The bus leaves about once every two hours. Right after me a few dozens of German cyclists arrived followed by their large bus, which meant that one German-speaking guide gave them a tour of the site and one English-speaking guide gave me a personal tour. She took me to the 3 tombs on the site (but there are many more out of the site), so unlike the only one tomb at the Kazanlak site, this site resembles more or less like the WHS at Vergina in Greece. The main tomb / room is structurally supported by caryatids, which is unusual in Thracia as well as in the USA, so I thought it would be nice to have such a tomb. Unfortunately, no photos were allowed inside of the tombs. I reached the site by taxi from Isperih, a 9km journey which cost 20 lev return. Taxis gather at the bus station, 1km north of the railway station. The tombs are open from Wednesday to Sunday only, entry fee 10 lev. My husband and I have visited the Sveshtari Tomb the last year and we were delighted by its beauty. There is a regime of controlled access to the tomb, which means that the visit can be done only with a guide from the office of the Sborianovo Archaelogocal reserve. The guided tour also provide visit to another Thracian tomb (the total of the tombs is more than 100) and the guide explains all the details of the style, the epoch and the importance of the tomb. The Tomb of Shvestari is Bulgaria’s second UNESCO-inscribed Thracian tomb (see also my review of Kazanlak). It is claimed to be “the finest Thracian tomb in Bulgaria” but, surprisingly, wasn’t excavated and discovered until 1982. When we were there in 2000 we could not get in. As you can see from the photo, that is a distinct negative, as the mound itself sitting in a field is not that interesting! I understand from some web sites however that, as of 2006, it might be possible – albeit with prior arrangements, to get inside. I quote “The whole is encased in a protective shell and is open to visitors, though at present, at irregular times - it's vital that you ring or call in at the museum in Isperih or at Aristour in Shumen to check that it's open before making a special trip”. Perhaps that part of Bulgaria has become more “tourist savvy” in the intervening years. We had great difficulty even getting locals to understand what it was we wanted to see! The nearest village is over 2kms away and the site wasn’t signposted along any of the several possible routes. Our few words of Russian for “Please - where is?” (We had no Bulgarian and English, French or Spanish didn’t help) whilst pointing at a print out of the UNESCO page for the site which contained a picture of the interior didn’t seem to lead anyone to link the presence of some “lost” tourists to this site and guess what it was we might be enquiring about! Or perhaps they just enjoyed having a laugh at tourists’ expense! 69 Community Members have visited.